These little guys really are irresistible! The meatball muffins are like a little bite size (or two bite!) meatball sandwich. Everything you want - a tasty meatball, a little drippy with sauce, melted cheese, and soft bread that gets a little soaked up with sauce - but in a much more manageable size, so it's not all running down your elbows. The pizza version is the same, minus the meatball - just a couple bites of saucy and cheesy goodness. They are very much like my pizza rolls, only shaped a little different. I made these for my kids to have for dinner, and enough to save for a school lunch later in the week. I don't think I can call these recipes, they're just too easy. These were really just something I threw together, but as soon as I shared it on IG and FB I had folks asking me for the recipe. So I guess these easy crowd pleasers are what you all want! I don't get as much opportunities to cook and photograph something as I'd like. This isn't one of those food blogs where people are cooking something just to photograph and blog about. No, here you are getting what we are actually eating. But this was a rare occasion when I was cooking something in the middle of the day to have ready for later, so I was able to actually get some nice photos of it for you. I use Trader Joe's crescent roll dough. I think it has a much more 'homemade' flavor than the other brands, and even though it's still quite processed it at least doesn't have a big long list of unrecognizable stuff in it. It doesn't come out of the can very nicely, they almost always tear when it pops open. I'm guessing that this is because the package isn't lined with all that nice BPA, so it's a tradeoff I"m willing to make. You could use biscuits as well, or you could certainly do this with any kind of homemade dough. One can of dough has 8 rolls, so you'll need 1 1/2 for a dozen muffins. I made two pans, half with meatballs and half without, so 3 cans of dough and 12 meatballs. My tomato sauce was just canned tomatoes, pureed with a blender. We had spaghetti and meatballs for dinner last night so I had heated up the meatballs in the sauce. I think you could use any kind of tomato sauce or pizza sauce. The meatballs I used were a combination of some homemade, and some frozen from the store - I had a little bit of each. My homemade meatball recipe is here. If you're going to make meatballs for this I would suggest you make them small. The dough is very tender, so I don't think it will hold a big meatball. These meatballs were all cooked and cold from the refrigerator (not frozen). And for cheese - well, I would have used shredded mozzarella, but I was out, so I just took some mozzarella string cheese and tore it into pieces. I think any kind of cheese you've got would be just great. Line muffin tins with dough. For the crescent rolls, I used one piece per muffin space, and just folded and worked it around to shape like a little nest. I did not grease my pans at all because my pans are new and pretty well nonstick, and this dough has a lot of fat in it. 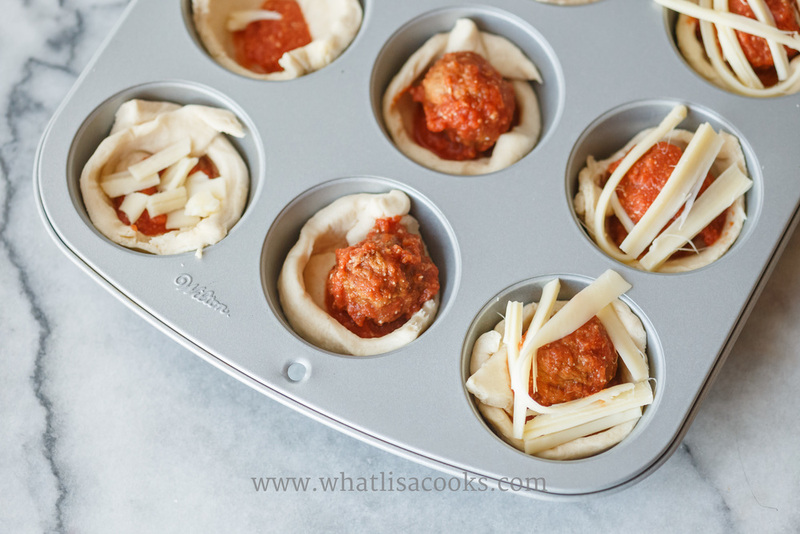 For the meatball muffins: place 1 meatball on top of dough. Cover with shredded or just pieces of cheese. If you have pieces of dough hanging over the sides, fold them over just a bit. Bake in a 350 oven for 12-15 minutes. Let cool for a few minutes before trying to remove from the pans, they are much easier to handle once the cheese has set up a little.